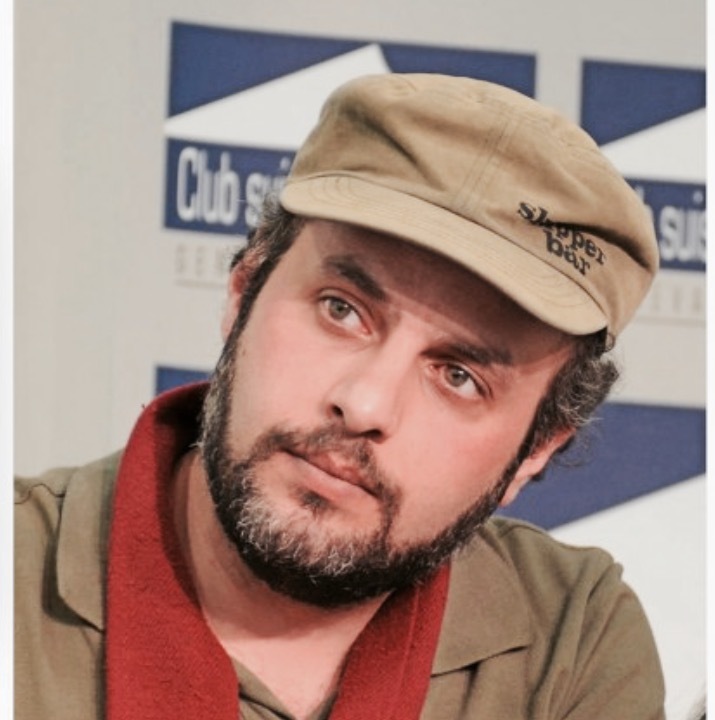 Hani Abbas is a political refugee from Syria and a well-known cartoonist, winner of the international Cartooning for Peace prize in May 2014. 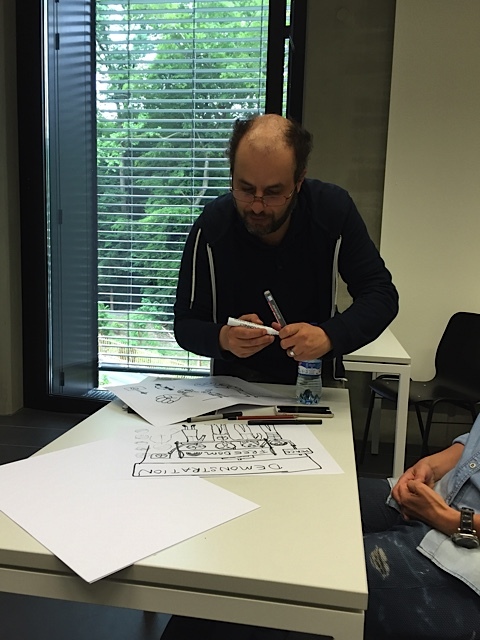 In Septembre 2014 he started a cartooning class at the International School of Geneva for children and adults. I had the opportunity to participate in this class which I found very well taught. During one of the last sessions we discussed about the situation in Syria. When teaching in class, his lines are smooth, round and soft, although very precise. He is very humoristic too. But when he draws about Syria and the suffering of the civilian people and children, the traits become sharp and with a few pencil strokes he manages to say much more than a journalist would in a thousand words. 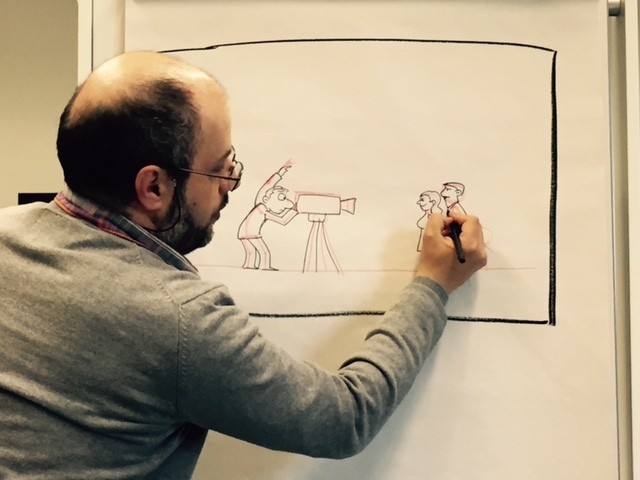 Indeed with Hani Abbas, I discovered the power of cartooning. Hani Abbas was born in 1977 in the Palestinian refugee camp of Yarmouk, near Damascus in Syria. His parents had fled Palestine in 1948 and settled down in Yarmouk in 1957 when the camp opened. He started drawing very young in his first UNRWA school. At 14 and 16 he had already received two international prize for his drawings. After finishing the Syrian secondary school, he went to the Teachers’ University in Damascus. Following his two year military service, he got married in 2007 and started, aside from his main work as a school teacher, to sell his cartoons to various newspapers – one Syrian government newspaper, Al-Jazeera.net and a few magazines abroad. He taught until the revolution. Hani Abbas did not expect the war to last so long. He thought the revolution would wipe out the Assad regime in one, two or three months. But the governement refused to recognize the civilian upheaval and therefore many journalists and cartoonists like Hani felt the urge to publish more and more about the political situation. It was only after two years of civil war that Hani decided to flee. From 2011 to 2013 he hoped for a resolution of the conflict. On many occasions, he refused to leave the country even if he had the opportunity to do so. During two years he survived, hiding with his family with no access to his bank accountfearing an arrest at the bank. In the meantime, many of his colleagues and friends disappeared or died after they had been arrested. Hani Abbas never expected to come to Switzerland he never even dreamt about it. Once in Lebanon, he settled in Tripoli, which was cheaper than Beirut. He was convinced that his stay in Lebanon will be short and that he will be able to return to Syria. He continued to publish for a Lebanese newspaper (Almodon, « The Cities »), for Al-Jazeera, for Reuters and for other local magazines. After the chemical attack of Guta, a small village near Damascus, in September 2013, Hani and his wife understood that there was no way back to Syria before a very long time. 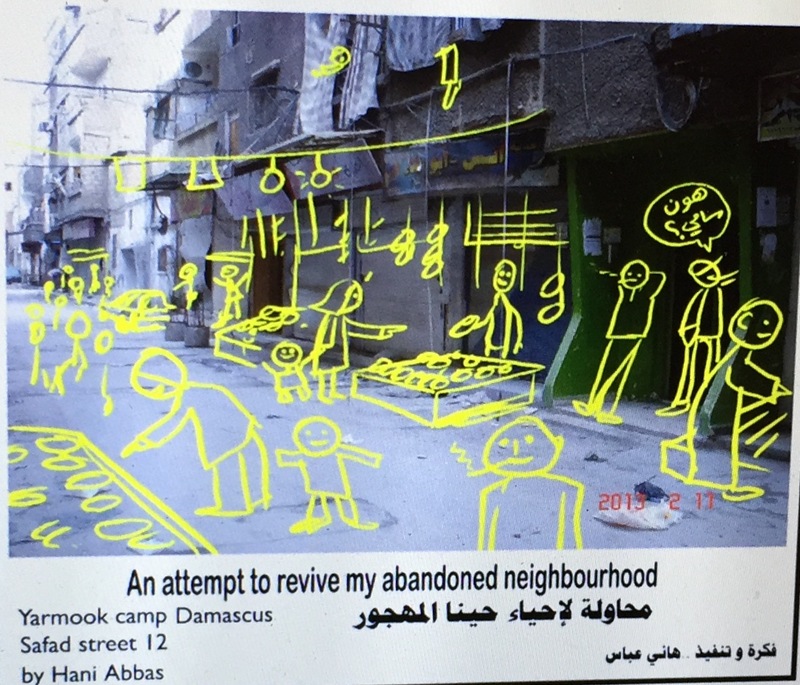 One day he published a cartoon on Facebook showing yellow figures in a demolished area of the ghost town of Yarmouk. The figures were drawn on the picture to give life back to the city. This cartoon was shared by many people on Facebook and eventually allowed him to come to Switzerland. Indeed, after one month, the cartoon became very famous. One day Hani was contacted by a woman from Geneva, Roberta Ventura, who wanted to buy the image. She asked for a high resolution image, asked for the price, insisted to send the money to Hani, framed it and hanged it in her living-room. A few weeks later, she asked Hani whether he could send her other images for an exhibition in Switzerland. He agreed and asked her if he could be invited to attend the exhibition in Switzerland. She sent him anofficial invitation but told him she could not garantee the outcome at the Swiss embassy. Hani himself did not really believe he would get any visa. But the procedure was extremely quick. Two days after his application at the Swiss Embassy in Beirut, he received a four day visa to go to Switzerland. After a long discussion with his wife, he decided to leave for Switzerland. It is only when he was in Switzerland that the idea of applying for asylum came to his mind. He decided to consult a few people and asked around whether it was a good idea. Had he any chance to receive a refugee status in Switzerland, how long would the procedure take, what about his wife and child ? Would they be able to come too ? I imagine that once more, the days and nights must have been very stressful for him as he only had two days left to decide what do do, stay or return to Lebanon, and also because this decision would mean a long separation from his family left in Lebanon. But he made the right choice and says he and his wife decided to do it for their son. In October 2013, he applied for asylum at the Centre for Asylum Procedure in Vallorbe. The procedure took 7 months. After 25 days in Vallorbe, Hani was transferred to Fribourg at a shelter where he qualifies the living conditions as hard : the rooms were crowded and the nights were difficult. But once in a while he was invited by Roberta Ventura at her place and sometimes he would also take a break in a hotel. Hani received his refugee status 3 days after the second hearing in May 2014. He was very relieved but sad at the same time for he had been told by his lawyers that it would take six months to have his wife and son come to Switzerland. Unable to announce the news to his wife, he decided to think it over for a day without calling her. He took the train to Geneva for a rest and felt extremely sad. Suddenly the phone rang and rang and rang again. Eventually he decided to take the phone, it was Roberta who told him that he had just received an email from the immigration office approving for family reunification. Hani was happy he hadn’t called her in the morning. (1) Read the opinion of Lina Khatib, director of the Carnegie Middle East Center in Beirut on Aljazeera.com, « Assad’s fatal strategic mistakes », 29 March 2014. Suivant En 1999 le recours aux « bunkers » suscite déjà l’indignation. Les politiques réagissent rapidement pour les fermer.